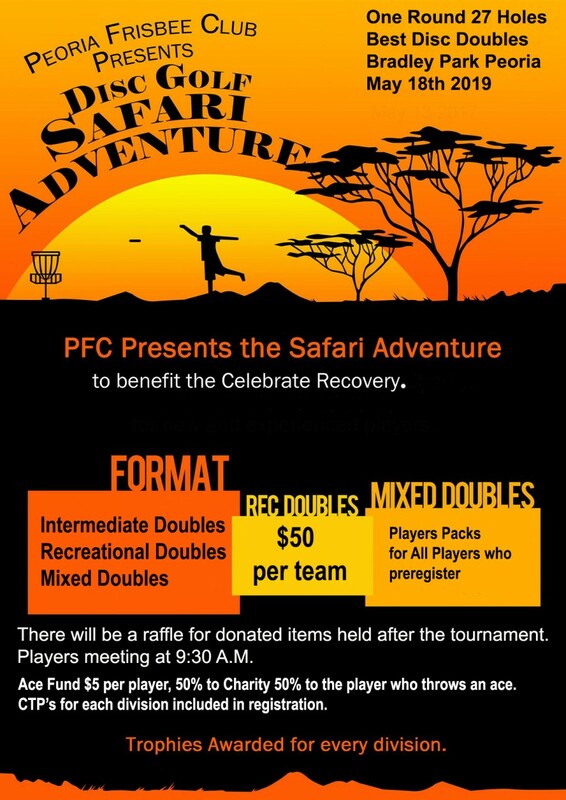 Disc Golf Safari Adventure 2019 is a fundraiser disc golf tournament to benefit the Celebrate Recovery 12-step program in Morton, IL. You can learn more about the mission of Celebrate Recovery at www.celebraterecovery.com. This is a family friendly 1 round of 27-hole tournament style event with three doubles divisions. The Safari layout uses the Bradley Park Disc Golf Course and a temporary 9 holes. There are three divisions; intermediate, recreational and Mixed Doubles Divisions (one male, one female). Player Registration is limited to 72 players, 36 doubles teams. Players Packs are included in the registration fee. Division winners will receive trophies and bragging rights at the Awards Ceremony after the tournament. There will be a $5.00 Ace Fund (hole-in-one), and any players who participate in the Fund and get an Ace will split half of the winnings, while the other half is donated to Celebrate Recovery. Entrance into the CTP (Closest to Pin) is included in each registration fee. The CTP winner(s) in each division will receive a donated prize. An Awards Ceremony will be held immediately after the completion of the round of disc golf. Trophies will be awarded to top ranked teams in each division. A raffle for donated prizes will be held during the awards ceremony. Raffle tickets will be available for sale starting April 1, 2019 and will continue until the completion of the round of disc golf. All proceeds from the sale of raffle tickets will go to Celebrate Recovery. Peoria Frisbee Club is responsible for all refunds and cancellations.